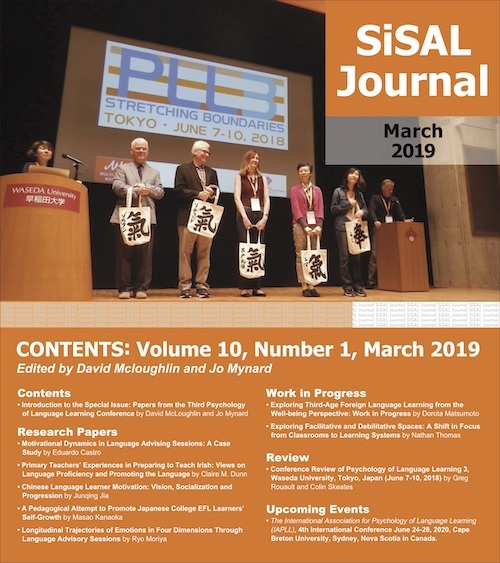 SiSAL Journal is planning to publish an ongoing column on practical experiences of establishing and running self-access centres and out-of-class learning spaces, entitled Language Learning Spaces: Self-Access in Action, over several issues, from June 2015 (Volume 6, Issue 2). 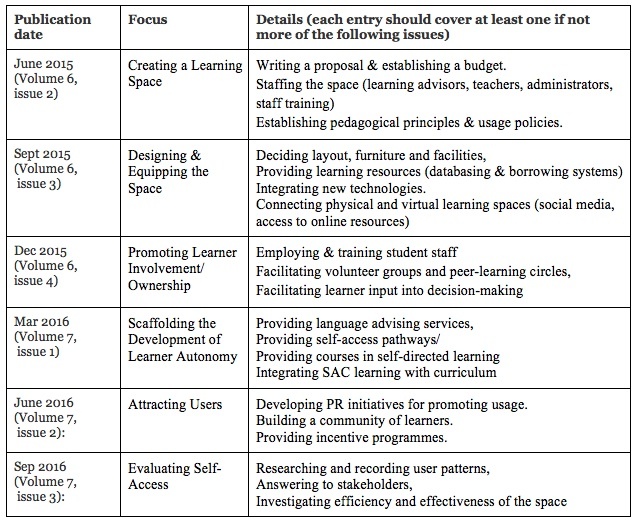 As self-access is such a practical field, involving the management of physical (and, increasingly often, virtual) learning spaces, it is beneficial for those of us working in such spaces to investigate how other centres are functioning, in order to learn from best practice and apply the lessons learned through these experiences to our own contexts. While this can be achieved through SAC visits and face-to-face meetings, there are often only limited opportunities to take part in such events. The existing literature on learning spaces, although it does often offer practical advice, is sometimes lacking in practical examples from differing contexts. The object of this column is to highlight specific experiences of various areas of self-access management in practice, with a view to providing multiple perspectives on each issue. Each instalment in this series will focus on one aspect of self-access, and contain 2 or 3 accounts describing how that issue has been handled in different contexts around the world. Rather than a How-to guide to be followed by the letter, it is hoped that these multiple perspectives will provide a reference point for practitioners dealing with self-access issues in a variety of contexts, such as EFL, ESL or multilingual environments, well-funded SACs or those operating on a shoestring. The column editor invites submissions of abstracts for the following aspects of self-access. Each abstract should be a maximum of 300 words, with the resulting paper being a maximum of 2500 words. The papers should be practical accounts detailing how that issue has been addressed in one particular context, including challenges encountered and the ways in which these have been addressed. Works in progress are welcome (indeed all self-access centres can be seen to be works in progress that will adapt to changing contexts). Although later instalments will not be published for several months, the editor requests that abstracts for all papers be submitted by the same deadline. Deadline for abstract submissions: Feb 10th, 2015. Please send abstracts to thornton.katherine@gmail.com, clearly stating Abstract for SiSAL Column in the subject line. If you would like to discuss a possible submission informally before submitting an abstract, you are strongly encouraged to do so by contacting the editor directly at thornton.katherine@gmail.com. Submissions will follow the usual blind peer review process. On completion of the column, the papers will be brought together in one volume as an ebook to be published by Candlin & Mynard ePublishing in 2017 (http://www.candlinandmynard.com). The papers may undergo some minor re-editing for the ebook version.